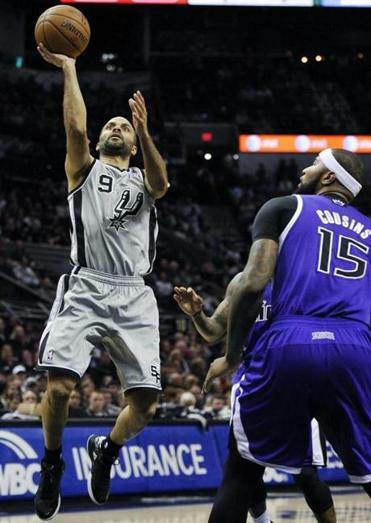 Spurs guard Tony Parker shot over Sacramento Kings center DeMarcus Cousins on Sunday, Dec. 29, 2013, in San Antonio. SAN ANTONIO — San Antonio Spurs guard Tony Parker apologized Monday for a newly surfaced photograph that shows him making the same gesture with anti-Semitic connotations that French soccer star Nicolas Anelka displayed while celebrating a goal this weekend, creating an uproar in their home country. The photograph shows Parker and a French comedian making a gesture known in France as a ‘‘quenelle,’’ which critics describe as an inverted Nazi salute. Parker said in a statement released by the Spurs that the photograph was taken three years ago. Parker, who was born in Belgium but raised in France, said he didn’t know at the time that ‘‘it could be in any way offensive or harmful.’’ He said he thought it was part of a comedy act and said he apologized for any misunderstanding or harm. ‘‘While this gesture has been part of French culture for many years, it was not until recently that I learned of the very negative concerns associated with it,’’ Parker said. Anelka’s club, West Bromich Albion, issued a statement Monday saying that Anelka has agreed not to perform the same gesture again. Anelka has defended his actions, saying he was merely expressing his support for French comedian Dieudonne M’bala M’bala, who performs the gesture on stage. The photograph of Parker also shows him posing with Dieudonne. Parker said in his statement that he would never repeat the gesture. ‘‘Hopefully this incident will serve to educate others that we need to be more aware that things that may seem innocuous can actually have a history of hate and hurt,’’ Parker said.